‘Whisper’ represents the narrative of loss during one person’s diagnosis of ovarian cancer. The power of illness especially when it involves a reproductive organ produces a loss of power, a loss of choice and a loss of perceived woman-hood. Ovarian cancer is sometimes called the ‘Whisper Killer’ as the disease usually goes undetected until its often too later to treat successfully. Sinead Dinneen titled her piece and over all body of work ‘Whisper’ as a way to quietly instigate dialogue about illness, cancer, death, loss and grieving. Sinead Dinneen is a visual artist and has been making art since the 1990’s. She turns to many art disciplines to interpret and express the visual needs such as photography, mixed media, fabric, printmaking, video, animation and clay. In 2013 Sinead was diagnosed with Ovarian Cancer. 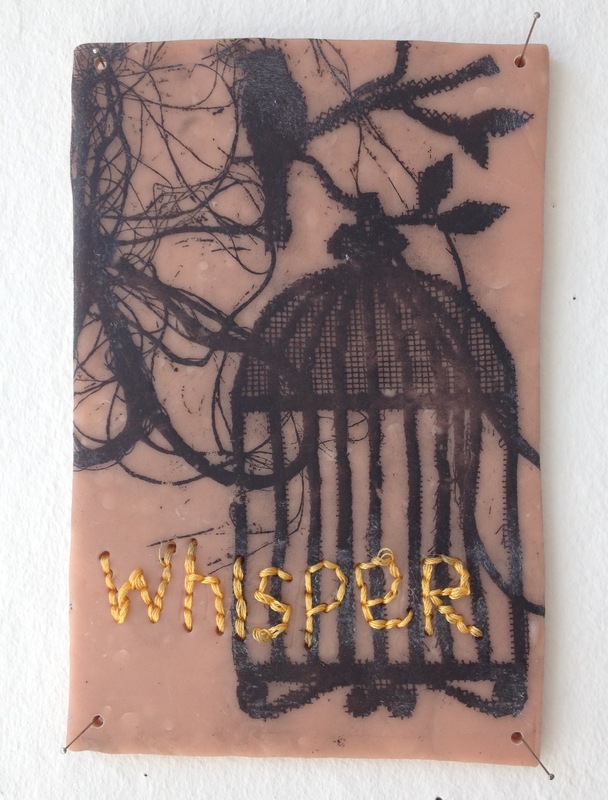 Sinead created a new body of work titled “Whisper” which is directly responds to her illness. Sinead’s work explores and highlights the feelings of loss and uncertainty with the diagnosis of a chronic illness. The narrative of femininity and illness is at the core of Sinead’s output. The main emotions surrounding illness are well documented but the public’s awareness of the intricacies of living with illness is less well known. Sinead’s work aims to create a dialogue about the many emotions and feelings that sometimes live at the margins of this existence. Sinead is a member of Ormston House and Limerick Printmakers Galley and Studio. Sinead currently lectures in Visual Art Education in Mary Immaculate College, Limerick, Ireland and regularly exhibits there.